Who doesn't love a good grilled cheese? No one, that's who. But, the recipe I am going to share with you today is not your ordinary bright orange slices of cheese between buttered bread. 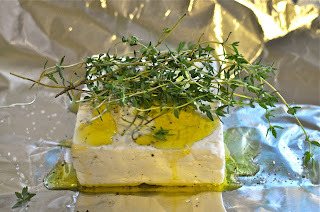 No, this is grilled feta infused with fresh thyme. Sound intimidating? Well, don't let the fancy words scare you off. This couldn't be more simple. In fact, it came from a suggestion in a recent issue of Real Simple magazine. 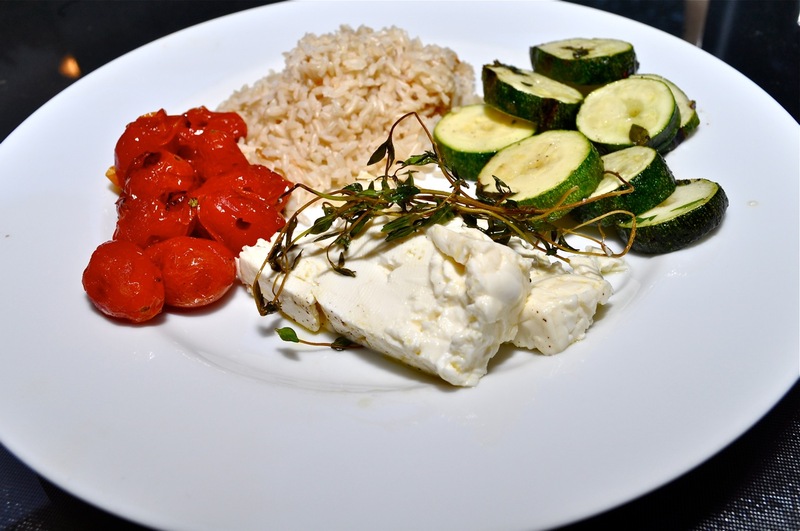 Start by placing a block of fresh feta on a square of aluminum foil. Drizzle with olive oil. Crack fresh pepper over the black and top with several sprigs of fresh thyme. (We have tons growing in our herb garden this year.) 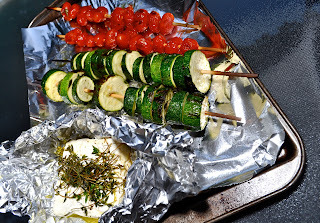 Then wrap up your package and place it on indirect heat in the grill for about 15 minutes. At the same time I had my carnivore cooking this gift wrapped goody, I also had him grill a few skewers of cherry tomatoes and sliced zucchini that I coated in olive oil, kosher salt, pepper, and garlic powder. In the meantime, he also grilled a piece of salmon for himself. The only thing I had going in the kitchen was the rice maker which bubbled away til our brown rice was perfect. Once everything was ready, I unwrapped the cheese and carved off a couple of melty slices. Served along side the veggies and rice, I had a meal that was satisfying, but not stuffing. 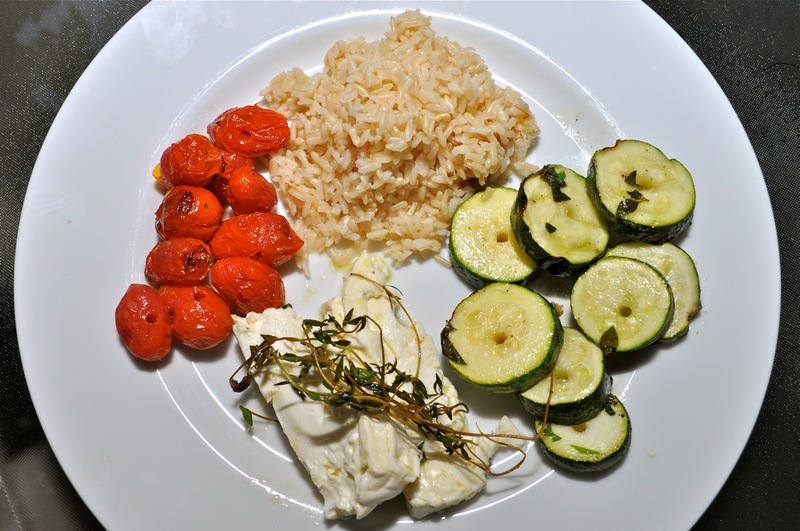 The salty and strong cheese paired nicely with the sweet squishy tomatoes and charred garlicky zucchini. The rice rounded out the meal nicely. This would also make a great appetizer at your next cookout. 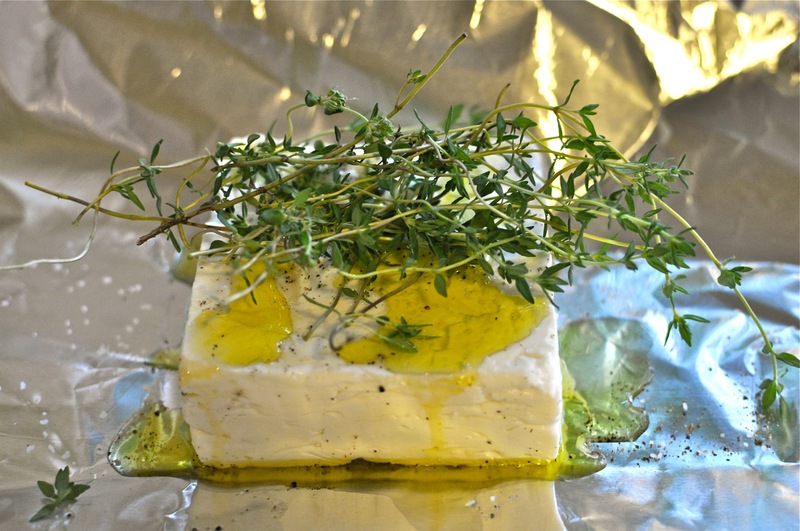 Once the feta is done you could put it on the table next to some nutty crackers and just let people dig in. What a beautiful, simple meal! I love it when cheese is the star of a meal. That looks fantastic!! 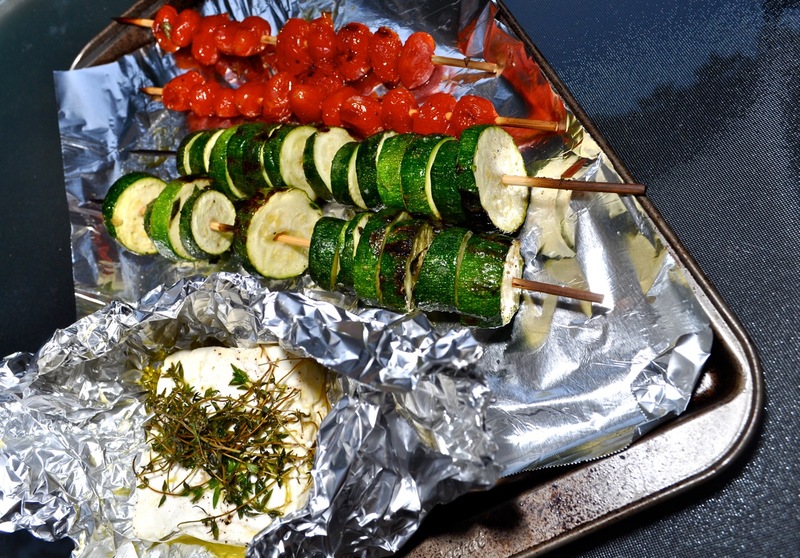 I cannot wait to try it when we grill this summer!